Randolph College is one of just seven schools in the nation to receive a Gold Level Student Actions Award from Purposeful Networks, formerly myActions. The award, announced recently, recognizes student sustainability efforts that positively affect communities and the planet. The Student Actions Awards are based on a methodology that celebrates student progress, momentum, and impact for the most recent semester. Recognition is awarded on four different levels: Green Level, Silver Level, Gold Level, and Platinum Level. Randolph was one of 125 schools recognized. Purposeful Networks encourages students to share their “green” efforts online as a way to inspire others and raise awareness for causes, programs, and movements for which they are passionate. Over the course of the 2014-15 school year, students from more than 170 colleges and universities shared more than 191,000 positive activities. Jessy Spencer ’18 first entered Randolph in the contest in the fall of 2014. The College earned a Silver Award that year. 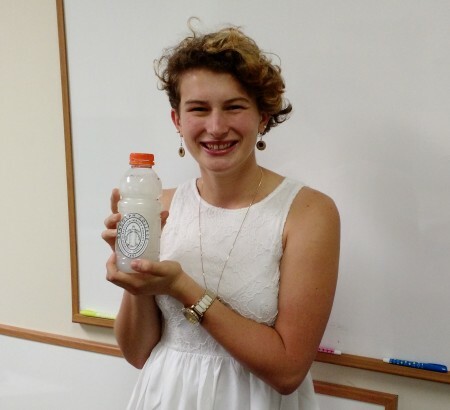 Jessy Spencer ’18 made her own laundry detergent during Recyclemania earlier this year. One of the student initiatives that helped Randolph win the Gold Award this spring was its impressive showing in Recyclemania, an eight-week competition that takes place among schools across the country. Randolph students recorded and reported their energy-saving and recycling actions each week. The efforts included actions such as turning off the lights, carpooling, refilling water bottles, and using stairs instead of elevators. As one of her contributions, Spencer concocted a recipe for homemade laundry detergent, which she bottled and distributed to other students on Earth Day. Randolph placed in the top five each week during the contest, and the College went on to finish third among all participating Virginia schools. Karin Warren, the Herzog Family Chair in Environmental Studies, said Spencer is helping expand Randolph’s sustainability efforts.